Despite heavy rain since last night, a total of 215 participants took part in the marathon. The heavy rain could no deter the spirit of the participants. 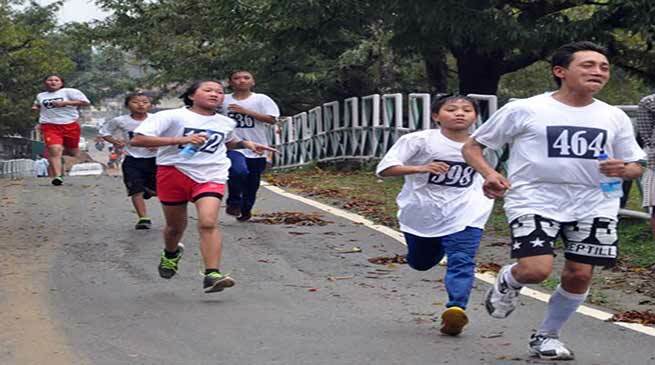 The Deputy Commissioner Capital Complex Himanshu Gupta today Flagged off the Half Marathon from Govt Secondary School Chimpu to IG Park Itanagar with the theme “Run For a Free and Fair Election 2019” under SVEEP. In the men’s category, Mudang Omo from Ziro completed the marathon in 29.20 minutes making him the winner of the event. 1st Runner Up Habung Nyipa also from Ziro completed the event in 29.26 minutes while 2nd Runner up Bamo Tamang from Chimpu completed in 30.12 seconds. All the three winners were awarded certificates along with cash prize of Rs 20,000, Rs. 15,000 and Rs. 10,000 respectively. Consolation prizes of Rs. 1500 along with certificates were also awarded to top 4th to 10th namely Koj Opo, Tago Sonam, Bagang Nagung, Lenjing Panyang, Loghi Sakap, Lokar Talo and Loghi Apa. In women’s category, Yabang Tali from Siang district came first by completing the event in 34.50 minutes. Nedi Ngi and Chera Loku both from Sangey Lhaden Sports Academy came 2nd and 3rd by completing in 38.43 minutes and 40 minutes respectively. All three were awarded certificates along with cash award of Rs. 20,000, Rs. 15,000 and Rs. 10,000 respectively. Pomen Teppa, Osinam Taying, Yambo Tweti, Rinchin Demarongradu, Kubila Yun, Chajing Wangnow and Ritu Tawsik came 4th to 10th and were awarded certificates along with cash prize of Rs. 1500 each. Kanki Darang, Addl CEO and DC Capital handed over the prizes to the winners at IG Park in the presence of ADC Shri Talom Dupak, SDO Smti Sangeeta Yirang, EAC Choiki Dondup, DSO(Sports) B Meitei and a host of other officers and officials. The DC lauded the performance of the participants and encouraged them to give their best in life. He hoped that the spirit shown by the participants today will definitely take them higher in life. He also read out a pledge, followed by everyone promising to vote in a free, fair and transparent manner.